We invite you to share our 'home away from home' located in the Waikoloa Villas complex. Here you will enjoy golf course, ocean and sunset views from the spacious lanai. We are located 25 miles north of the Keahole-Kona Airport and six miles from the world famous Hilton Waikoloa, Mauna Kea and Mauna Lani Resorts and beautiful white sand beaches. The two bedroom, two bath condo is furnished in a tropical motif. There are two queen size beds in the downstairs bedroom and a king size bed in the master bedroom. The master bath has a large jetted spa tub for your relaxation. The living room features cathedral ceilings and opens to a spacious lanai with wetbar. The full kitchen is complete with all the cooking ware, paper goods, spices and staples you will need for meal preparation. Linens and towels are provided and there is a washer/dryer within the unit. There is a HDTV, DVD and Radio/CD stereo player and HIGH SPEED/WIRELESS INTERNET SERVICE. The unit is located along the 9th fairway of an 18-hole Robert Trent Jones Jr. designed golf course. The clubhouse and pro-shop are one block from the complex. It has received a four-star rating in the Golf Digest's Best Places to Play and other golf magazines. DISCOUNTED GREEN FEES are available for our guests. There are many other beautiful courses nearby. This is truly a 'golfer's paradise'. There are two swimming pool and spas areas within the complex. Full kitchen facilities with two well maintained gas Barbeques are also available in each of these areas for larger family gatherings. Tennis courts are available at the clubhouse at no cost. Water Aerobics are scheduled at the community pool next to the clubhouse on MWF at 9:00 a.m., also at no cost (you will need a guest card). You will be a short stroll from the Waikoloa Village featuring a large grocery store complete with fresh butcher, deli and bakery, a bank, restaurants and other shops for your convenience. You will find this is a perfect location for those side trips to Waimea (Parker Ranch), driving along the Kohala and Hamakua Coasts, shopping and dining at the nearby Kings and Queens Shopping Centers, the new Mauna Lani Shops or Kailua-Kona. Enjoy a day trip to visit the volcano and the Hilo side of the island. There are beautiful beaches and points of interest along the way to all of the above destinations. Come relax and enjoy your time on the Big Island of Hawaii. RATES VARY BY SEASON - SEE RATE SCHEDULE. You have a wonderful view of the 9th fairway from our lanai. From the lanai you will overlook the golf course and view the ocean and somedays you will see as far as Maui! Ceiling fans in living room and both bedrooms. Two large portable fans for the occasions that the ceiling fans are not enough. Our trade winds are the best and a wonderful source of A/C. At the community center about a 5 minute walk from our unit. Check for hours open. Inside dining seats 4 Lanai dining seats 5 (this is where you will most likely eat your meals). There are several books about the islands available for your enjoyment. Several boogie boards and some beach toys are available. View well maintained garden area from the lanai. Courts located at the community center. 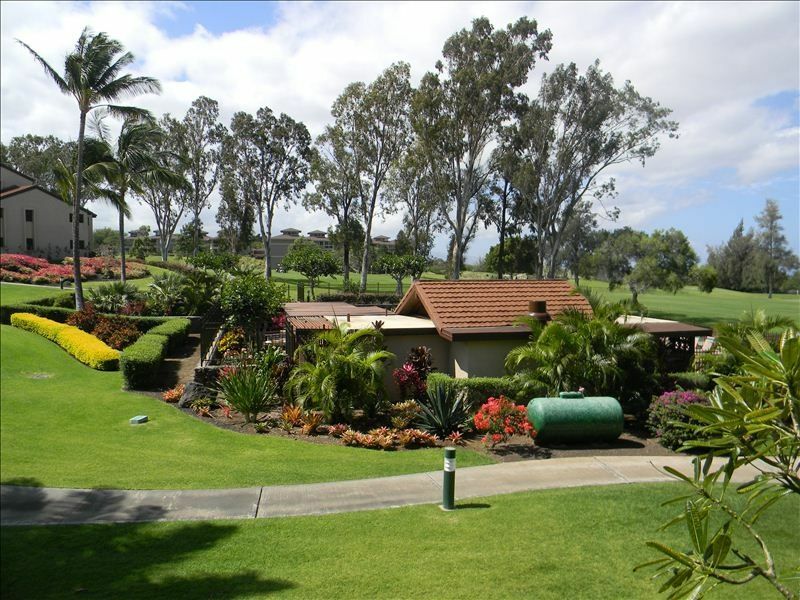 Property overlooks the 9th Fairway of the Waikoloa Village Golf Course. Discount green fees provided for guests. (2) There are two pool and spa areas in the complex. Beach Towels, Beach Chairs, Boogie Boards, Beach Umbrella, Cooler available. I loved this condo and it’s location. It was so quiet and peaceful. With the lanai facing the gardens, it made morning Kona coffee that much more enjoyable. The kitchen was fully stocked with everything that you would need. Lots of towels and beach towels were available to use. The condo cooled down very quickly in the evenings when you opened the windows to allow the trade winds into the house. Quiet, comfortable condo in an excellent location. Just a short drive away from our favorite beaches, farmer's markets, excellent dining and the local coffee shop and grocery store. Yet far enough away from the resorts that it was quiet and we could relax from our lanai. Love the layout of the condo. The owner was quick to reply to our requests and was very accommodating to our needs. This is the second time we have stayed in Waikoloa Villas and would do so again without hesitation. The location of the property is perfect for us. We have stayed in the area before and really like the location. Close to some amazing beaches. The condo complex is well maintained. Access to the pool and BBQ area was in close proximity. We swam in the pool most days. It was clean and provided enough space to swim laps. The condo is tidy, but could use some updates. The owners were exceptional at responding to questions and needs immediately. Waikoloa Villas are extremely well-kept (grounds, bbq, pool) and are in a great location - quieter, less busy, and cooler in the evening with fantastic star gazing. Susan was exceptionally friendly, helpful and easy to communicate with. The condo was very clean and we appreciated all the kitchen and beach supplies. The only downside was that when we were there in August, it was very warm and the windows + ceiling fans + portable fans were not always enough to keep the place comfortable. We hope to be able to return sometime during the winter months! very comfortable place to stay while in big island. unit doesn’t have central conditioning but due to nice breeze in the area didn’t need it. it’s on second floor so slightly difficult moving our suitcases. Luaus, explore the Petroglyph Fields and Ancient Fish Ponds, Helicopter Rides, Coffee Farm Tours, Volcano National Park, Imiloa Center for Astronomy (Planatarium), Botanical Gardens, Black Sand Beaches, Swim with the Dolphins, Snorkeling, City of Refuge and other ancient ruins.